It’s not just that Gotti is a bad movie – and it really, truly is – it’s that watching it you begin to wonder if anyone working on it had any idea of how misguided and inept it all was, from the opening scene that sees Travolta as Gotti breaking the fourth wall and beginning to tell his story from beyond the grave, to the final scene, where Travolta as Gotti again speaks to camera and brags that you’ll never see anyone like him ever again. These scenes are bad enough, what with their eulogising of Gotti and his flamboyant look, but they’re overwhelmed by the sheer awfulness of what unfolds between them. This is a movie that doesn’t so much shy away from being impartial, as get into an Indy 500 car and race off into the distance at top speed in order to do so, and it’s not long before you realise that the script – by cast member Leo Rossi and Lem Dobbs – has been constructed to lionise Gotti and his life of crime. In other, more capable hands, the contemporary footage of Gotti supporters praising him in the wake of his death in 2002, would have been used to make an ironic statement about his public persona; instead they’re used for exactly what they are: idolaters remembering (for them) a great man. In terms of a wider ineptitude, Gotti struggles to get anything right. 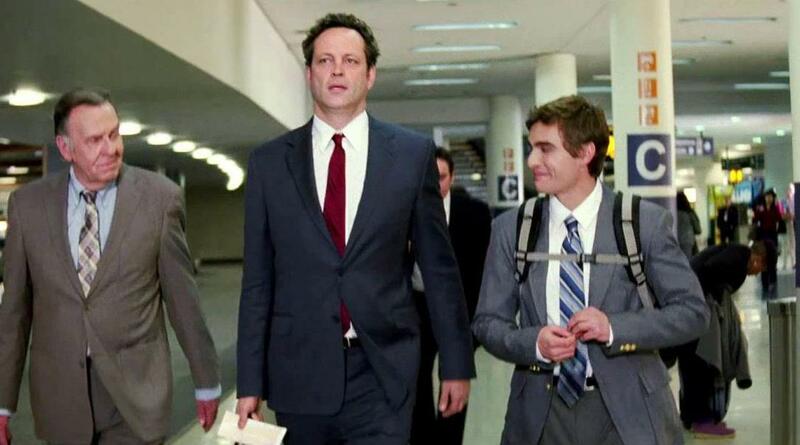 Having decided to impose a non-linear narrative on itself, the movie plays like a rough cut where scenes have been jumbled together and still need to be assembled in an effective, relatable order. It’s a lucky coincidence if one scene follows another and there’s a connection between them, and many are short, leaden and lacking in relevance. 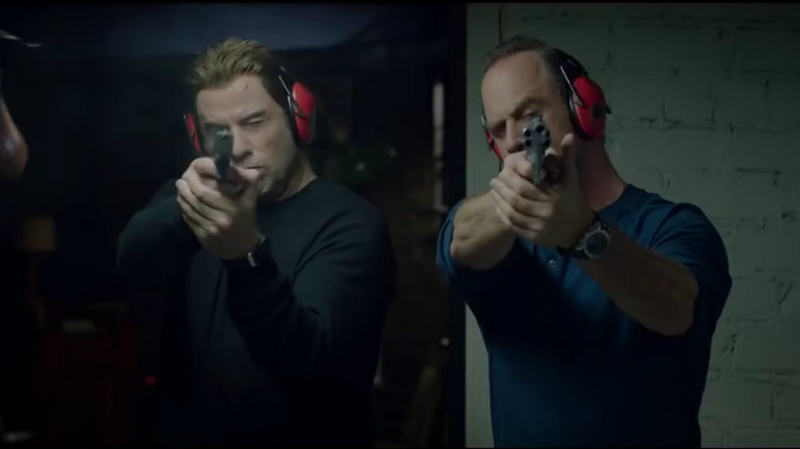 Gotti‘s editor, Jim Flynn, fumbles reaction shots, drains scenes of any energy or flow, and makes what should have been one of the movie’s standout set pieces, the execution of Gambino Crime Family boss Paul Castellano, into an exercise in how not to depict a shootout. It’s a mess of randomly stitched together shots that leaves the viewer with no way of knowing who is shooting who, or how many times, or where from (and that’s without the CG blood spurts). In fairness, Flynn’s job may have been made more difficult thanks to a lack of coverage provided by the movie’s director, but even if that is the case then it serves only as confirmation that Connolly, whose previous outing, Dear Eleanor (2016), is well worth seeking out, is here either out of his depth or hasn’t learnt very much during the course of his twenty year plus directing career. It would be some consolation if the performances offered a respite from the dreary depictions of backroom betrayals, the travails of John Gotti Jr (Lofranco) – here made out to be something of a paragon of virtue for turning his back on his criminal lifestyle – and several random killings that are meant to mean something but never do. However, Travolta aside (this became a personal project designed to give a boost to his ailing career), it appears that the rest of the cast decided that because of the script’s propensity for volumes of exposition, and its lack of a coherent story, as well as its wafer thin characterisations, that a minimum amount of effort should be expended. 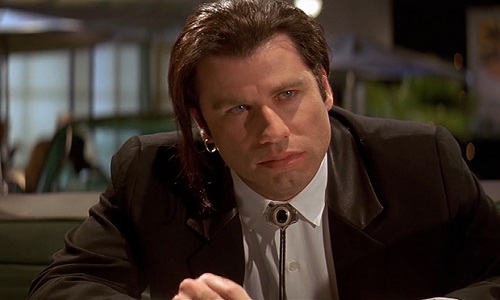 Travolta tries too hard, and grinds his teeth a lot in that way that he has when he wants his character to be taken seriously, and Connolly does nothing to rein him in or modulate the performance. (Spare a thought though for Lofranco, taking on the role of Gotti Jr and having to create the character from scratch; as far as the script is concerned he’s a blank page.) 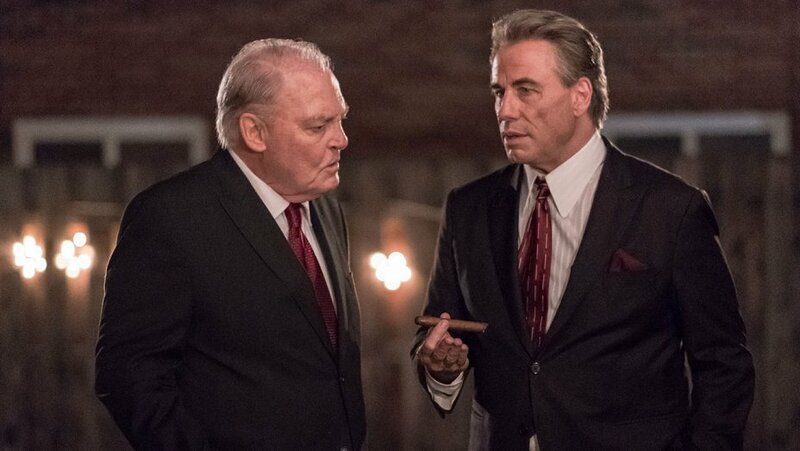 In the end, the script gives Gotti an elegiac send-off, providing further evidence that this is far from the gritty exposé viewers might be expecting, and instead something that could easily pass as a celebration of a smartly dressed murderer – and without the judgement. 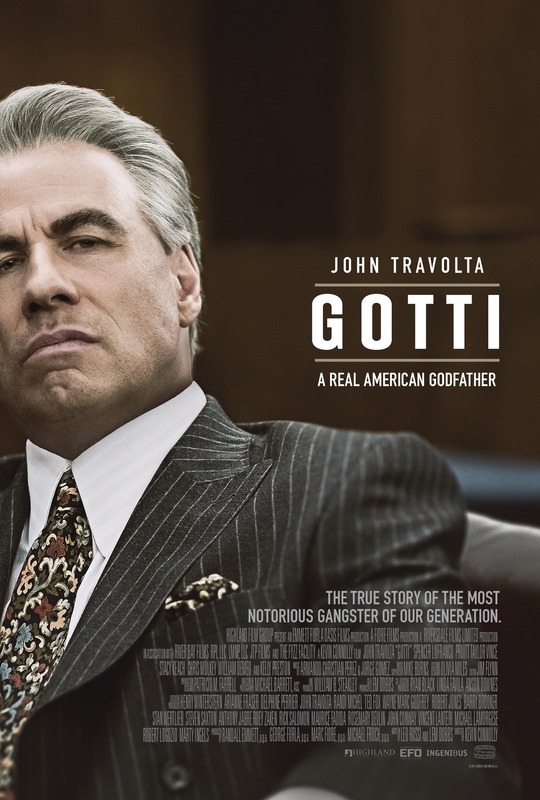 Rating: 3/10 – a terrible movie about a terrible man, Gotti sinks to new levels of silliness, stupidity and inadequacy, and works best as an object lesson in how not to put together a true crime biography; fully deserving of whatever criticism can be levelled against it, it’s a movie that feels like a patchwork quilt of bad intentions and low ideas, and which routinely undermines itself at every turn, leaving it looking and sounding like the trainwreck of all trainwrecks. These days, Westerns come and go infrequently, but largely seem to be a cause for (minor) celebration. A genre that had its heyday in the Fifties and Sixties, the Western was a simple beast, telling classic tales of good versus evil (white hats versus black hats, cowboys versus Indians), until they got darker, more symbolic, and infused with heavy psychological importance. In the last twenty years, the Western has lain relatively dormant. But for some movie makers, the Western is a genre that’s ripe for re-evaluation and examination. Ti West, who has made his name on the back of a run of horror thrillers, is one such movie maker. And so, we have In a Valley of Violence, his “tribute” to the Western genre. Ten minutes in and already we’re in classic Western territory (almost as classic as its New Mexico setting). We’ve got the tactiturn, quick-witted loner (whose name we later discover is Paul), and we have a supporting character in the priest that you can be sure will make another appearance later on. And then there’s Denton, a town that, according to the priest, is “run by sinners”. As Paul heads into town, the viewer could almost be asking themselves, “What could possibly go wrong?” The answer is as obvious as the scar on the side of Paul’s face: everything. And at first, it looks as if West is going to honour all the staples of a Western movie. The loner rides into town, and within minutes is being challenged by the town bully, a loudmouth by the name of Gilly Martin (Ransone). A showdown is on the cards, as Gilly goads the stranger in town into a gunfight. But here’s where West wrong foots the audience, and instead of a classic gunfight in the middle of the street, Gilly’s efforts to call out Paul meet with quiet dismissal. Until Gilly realises that Paul’s dog is across the street and makes a threatening move towards it. It’s too much for Paul: he comes out, water bowl for the dog in hand, throws it at Gilly, and when he catches it, Paul punches him once in the face and lays him out. Not a shot fired, not even a gun drawn out of a holster. The lead-up is stretched out, but the fight is short, and the outcome is funny as all hell. We’re in classic Western territory all right, but somewhere along the way, West has taken his audience down a different trail, and though quite a lot of what follows cleaves to the staples mentioned above, it’s clear that West is going to put his own spin on things. 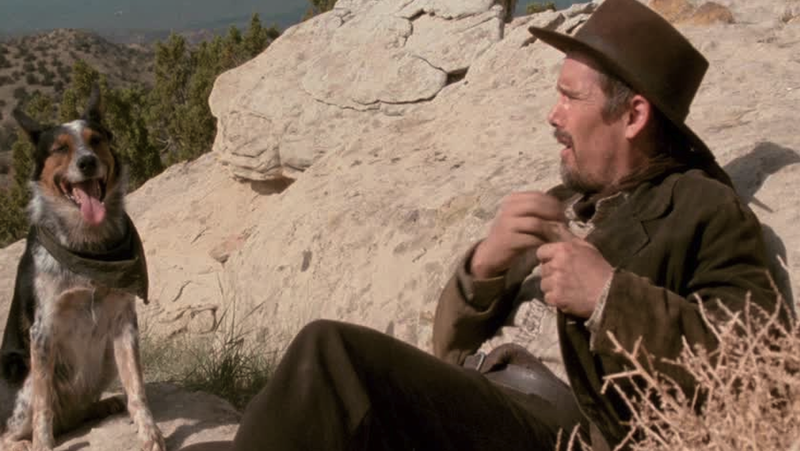 But therein lies the problem with the movie as a whole: it’s a classic Western that’s been bent out of shape, and though it looks like a Western, and it sounds like a Western (even down to Jeff Grace’s Morricone-inspired score), it’s only a Western in terms of its starting-off point. Once Paul throws that bowl, we’re in a whole different kind of Western altogether, and a lot of it doesn’t fit together. There’s a lot of sly humour here, and while it would be unfair to pin the blame for the movie’s unevenness on the humour alone, it does contribute greatly to the sense that West, while he definitely wanted to make a Western, didn’t quite know what kind of Western he wanted to make. 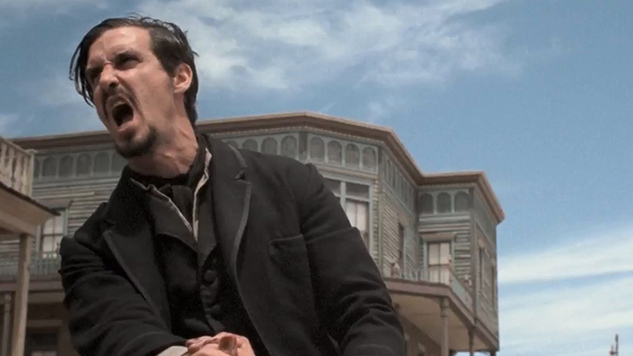 As a result, bullets do fly, and revenge is placed firmly on the table as a motivating force for the violence, but there are other elements – sibling rivalry, public confidence in the town marshal (Travolta), bravery and cowardice co-existing at the same time in most of the characters, lead-footed moments of irony – that are part of the material, and which serve to either slow down the movie, or make it seem ragged and unfocused. The other problem is with the characters themselves, archetypes that are also twisted out of shape. At one pivotal point in the narrative, Paul is ambushed by Gilly and his men. West can’t decide from one moment to the next if Paul should be angry, upset, fearful for his life, pleading, or stubborn in the face of imminent death, and so has him be all of these things. Hawke’s a great actor, but even he can’t pull off all that. When we meet the marshal, we find he has a wooden leg and is of a temperament to let his son get a beating from a stranger (yes, Gilly is his son), and not pursue it because he knows what his son is like. The wooden leg proves to be incidental, while the decision to send Paul on his way, proves to be an awkward way of allowing the revenge angle to be introduced. Gilly himself is vainglorious and stupid, and vacillates between the two, sometimes in the same scene. As a result, Ransone has a hard time keeping him even remotely credible as a character. Farmiga is the sixteen-year-old whose husband has left her(!) and wants to leave town (but won’t do it unless a man takes her with him), while Gillan (as her sister) gets to screech a lot at Ransone, and generally behave like a spoilt brat. 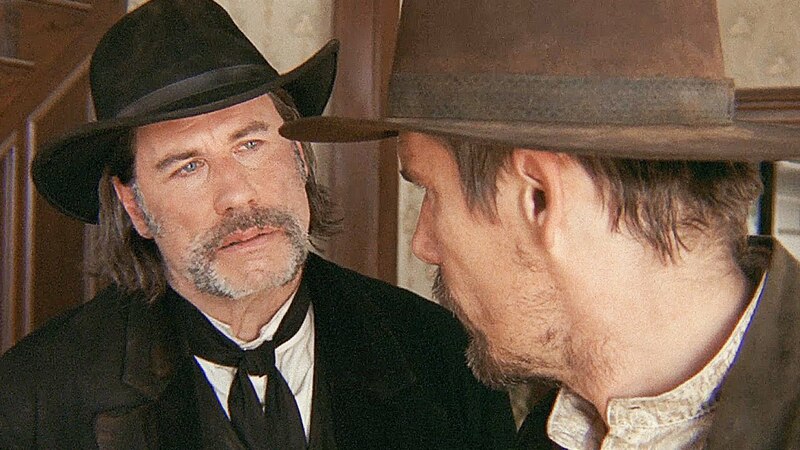 While many Westerns play up the stereotypes of the genre, usually it’s a welcome gambit – a movie shorthand, if you will – but here, the impression given is that West wasn’t too interested in having his characters interact or behave in a way that the audience could identify or sympathise with. Visually, West does provide enough cues and familiar set ups to make his Western look and feel authentic, and the town of Denton is cleverly realised, from its boarded up church and empty saloon, to the absence of its townsfolk or any thriving businesses. It’s a ghost town in the making, and what better way to help it on its way than to bring in a lone stranger to kill most of the people who still remain there? Of course, being a Western there’s plenty of violence, and West doesn’t skimp on making it impactful and severe, with Fessenden and Ransone in particular suffering quite nastily at Hawke’s hands (and cutthroat razor, and boot). But again, there’s that humour to soften the blow, but it’s not as successful in that respect as West has probably intended. Instead the two elements sit together unhappily, with neither elevating the other. Something of a vanity project for West, the movie does work for the most part, but there are too many occasions where the awkward mix of styles and elements derails the narrative, and brings everything up short. This leads to the movie having an awkward rhythm as well, with some scenes extended beyond their ability to be effective, or to advance the various storylines. Hawke is a great choice for the lead role, while Travolta appears to be having more fun than he’s had on a movie set in years. There’s enough to admire here without feeling that West has done his audience a disservice, but there’s also enough here to leave said audience also feeling that he hasn’t quite done enough for them either. Rating: 6/10 – ambitious but ultimately disappointing given West’s track record so far, In a Valley of Violence never really reconciles itself as to what kind of Western it wants to be; Hawke and Travolta make for appealing adversaries, and there’s a sense that if West had adopted a more straightforward approach, this could have been the classic modern Western he was (perhaps) aiming for. The career of John Joseph Travolta has had its fair share of ups and downs (though in recent years it’s consisted mostly of downs). Inhabiting the strange netherworld of DtV movies nowadays, Travolta seems to be flitting from one career-killing project to another with no apparent concern for his legacy as an actor (something that could be attributed to a lot of other actors as well – eh, Nicolas Cage?). But overall, Travolta has had a great career, and appeared in several modern classics over the years, and this is reflected in the movies that make up the list below. The most recent movie in the list may be from 2008, but a recent return to form in The People v O.J. Simpson: American Crime Story (2016) hopefully will see the tide turn. But if it doesn’t, we’ll still have all these great movies to remember him by. In the year that also saw Travolta play an angel in Michael, Phenomenon gave us a chance to see him as, possibly, the recipient of a gift from God. 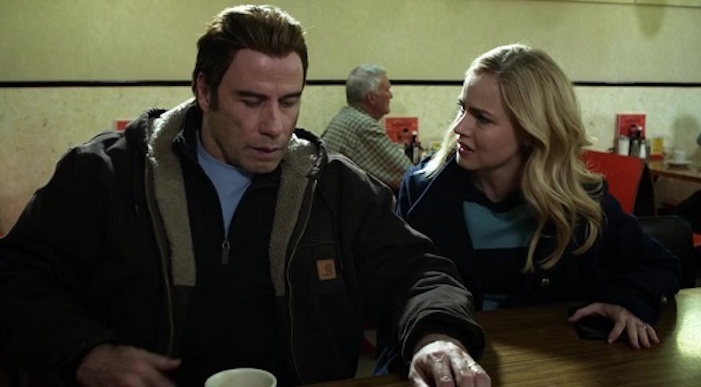 Newly imbued with super-intelligence and telekinesis after seeing a bright light in the sky, Travolta’s ordinary Joe becomes an object of fascination, and notions of faith arise too. It’s an uneven movie, but Travolta is good in the central role of George, and if the whole thing falls apart by the end it’s not because of bad intentions, but purely because the script paints itself into a corner it can’t get out of. John Waters + John Travolta in a female body suit + song and dance numbers = one of Travolta’s most enjoyable movies. He may not have been everyone’s first choice for Edna Turnblad, but Travolta gives one of his most relaxed and engaging performances alongside “hubbie” Christopher Walken. A movie bursting with energy and giddy vitality, Hairspray is still as vibrant today as it was ten years ago, and Travolta is a big part of why that’s the case, reminding us that he can still move it and groove it. Quentin Tarantino’s second movie has been pulled part, analysed from the first frame to the last, and generally obsessed over by critics and fans alike ever since its release. It’s simply an incredible breath of fresh cinematic air, and remains a true one of kind over twenty years later. It’s also the movie that brought Travolta back in out of the cold after a career slowdown that had left those same critics and fans wondering if he’d ever get his career back on track after a string of duds that included Two of a Kind (1983) and Chains of Gold (1991). In terms of his performance, it’s arguable that he’s never been better, and his scenes with Uma Thurman are as mesmerising now as they were back then. The movie that brought Travolta everlasting fame, Saturday Night Fever is a gritty wish-fulfilment tale that’s become overshadowed by its soundtrack, but forty years on it still has a power and a coarse energy that keeps it feeling fresh and not just a time capsule look at an era now long gone. Travolta is so convincing as Tony Manero that you can’t imagine anyone else playing the role, and though it spawned a million and one parodies – the best being in Airplane! (1980) – that white suit and Travolta’s defiant strutting, both on and off the dancefloor, are still as iconic as ever. John Woo given (nearly) free rein + John Travolta + Nicolas Cage + more mayhem and carnage than you can shake a church full of doves at = an even barmier and over the top movie than Broken Arrow. Face/Off is one of the maddest, strangest, but totally enjoyable action movies of the Nineties. Woo directs as if he doesn’t care how looney it all is, and Travolta – along with his future DtV compatriot Cage – goes along for the ride, hamming it up as much as he can and having a whale of a time. He’s out there, and he wants you to come with him… and how can you refuse? At this point, you might be saying to yourself, “Wow! Really? Wild Hogs? Over two hundred and fifty million? How did that happen?” And on the surface, you’d be right, but dig a little deeper and the movie has some (well) hidden depths, as well as a quartet of hugely enjoyable performances, including Travolta as the de facto leader of the Hogs. It’s an undemanding movie, but Travolta is easy-going (even when playing uptight) and immensely likeable, and when his character gets easily flustered, it’s a sight to see – purely because it’s a trait he rarely gets to display elsewhere. One to file under Don’t Knock It If You Haven’t Seen It, and a lot funnier and warm-hearted than you’d expect. To date, Bolt is Travolta’s second and last animated movie, after Our Friend, Martin (1999). Unfairly overlooked when it was first released, there’s a lot to be said for the first movie that John Lasseter oversaw upon jumping ship from Pixar to Disney, not the least of which is the unexpectedly inspired choice of Travolta as the title pooch. He’s clearly having fun with the role, and that comes across in his performance; which begs the question, why hasn’t he made more animated movies? Whatever the reason, Travolta is definitely one of the main reasons for the movie’s success, and his performance more than justifies the producers’ making him first choice for the role all along. As the Kurgan (Clancy Brown) put it in Highlander (1986), “There can be only one”, and sure enough it had to be Grease. Even if you’re not a fan of musicals, you have to admire the sheer exuberance and exhilaration of the dance sequences that make up most of Grease‘s allure, along with its way-too-catchy songs and endlessly quotable dialogue (“Let’s hear it for the toilet paper!”). 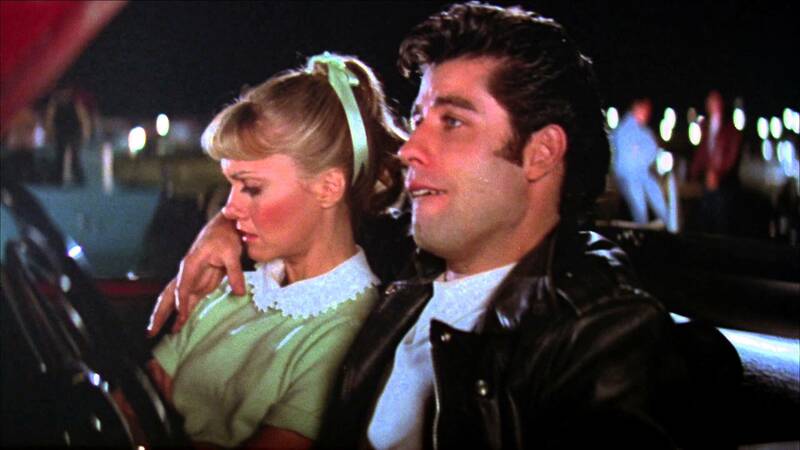 As the belligerent/charming Danny Zuko, Travolta makes a virtue (of sorts) of thrusting his hips as often as he can in Olivia Newton-John’s direction, as well as looking out of his depth, and all with a virile swagger that recalls any number of teenagers from those Sixties beach movies. A great performance in a classic musical, pure and simple. You’re an ex-Black Ops veteran turned law-abiding car engineer about to work for Honda (probably). You come home from a job interview and meet up with your wife who’s working on an independent review of a proposed water pipeline that’s being backed by the state governor. Both of you are approached by a shady looking guy who wants help paying his parking ticket. You warn him off but he gets offended. The next thing you know, you’ve been hit over the head and are on the floor, then the shady looking guy pulls out a gun and shoots your wife. She dies instantly. Thanks to your knowledge of cars, you recognise the sound of the car engine the shady looking guy and his two accomplices drive off in. Later, at the police station, the detectives assigned to your wife’s murder are sympathetic and helpful. Even later, those same detectives tell you they’ve got someone who may have been involved. At a line-up, you pick out the shady looking guy thanks to the distinctive fly tattoo he has near his right eye. And right then and there, the rug gets pulled out from under you: the detectives don’t have enough evidence to arrest him. The shady looking guy goes free. Now what do you do? 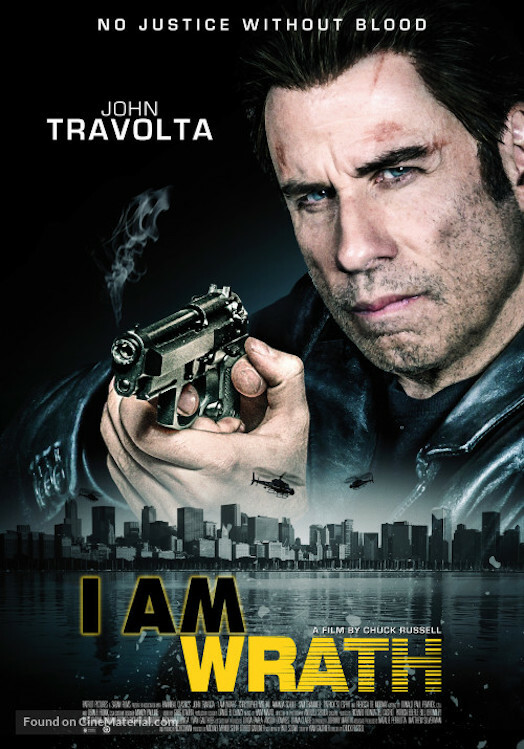 Well, if you’re John Travolta, and the movie you’re starring in is called I Am Wrath, then you tool up and go after the man who killed your wife, and his two accomplices. But what is it that prompts you to do this? Is it a profound sense of justice needing to be done? Is it anger and a need for revenge? Is it because you’re fed up with leading a “normal” life and you want to get back to killing bad guys? Or is it because a Bible the priest at your wife’s funeral gave you, lands open at a particular place (Jeremiah 6:11 to be precise) after you’ve thrown it to the floor? And is it because the phrase “But I am full of the wrath of the LORD, and I cannot hold it in” is featured there, and it seems like God’s giving you permission to go out and kill some people? Well, praise the Lord. Seems he doesn’t mind people committing murder after all. 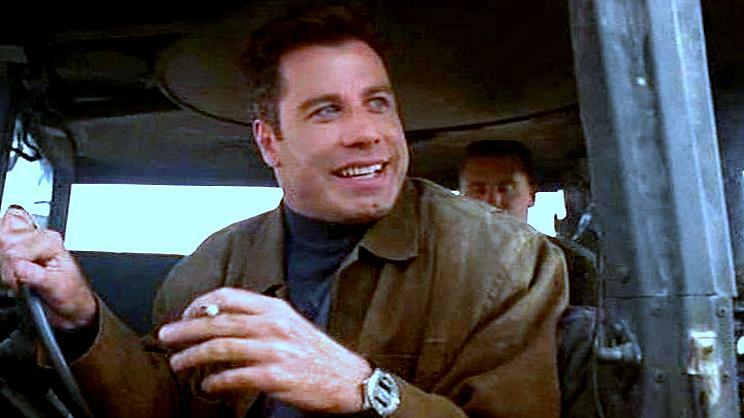 This is exactly how Travolta’s character, called Stanley Hill (and since when did Travolta ever look like a Stanley? ), comes to make the momentous decision to take the law into his own hands and seek vengeance on shady looking guy and his pals. If you’re in any doubt as to how good or bad this movie is at this point, then rest assured the scene with the Bible is as far from cinematic gold as it’s possible to get. Travolta hurls the good book to the floor. It lands cover side down and open at the aforementioned passage. Travolta looks over at it. He gets up, a look of consternation on his face. As he approaches the Bible he begins to look as if he already knows what he’s going to read when he picks it up. And once he does, there’s no doubt: it’s a sign! And he knew it was a sign! Stanley has been given a sign from God (even though he’s not a praying man)! Say Hallelujah everyone! Unfortunately for I Am Wrath, any further religious overtones or connotations are abandoned with undue haste. 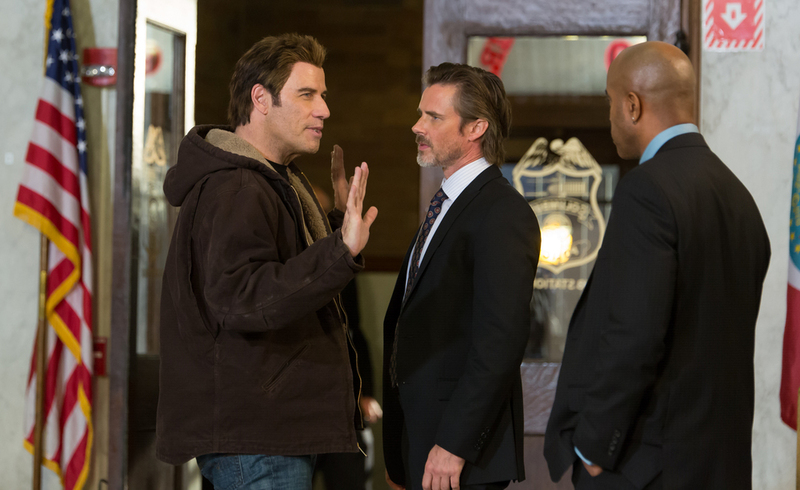 Save an artless confessional scene much later on, the script and direction steer well clear of any religious undertones and concentrate on Travolta – aided by Meloni as his pal from their Black Ops days – and his mission to avenge his wife’s death. Along the way he discovers a conspiracy that involves the police, a local crime lord, and – shock! horror! – the state governor. What could have been an intriguing, finely balanced exercise in the nature of faith versus morality, instead becomes yet another tired actioner where one man and his friend take on a whole bunch of bad guys, break every law going in the process, and are cheered as heroes for “taking out the trash” (quite literally at one point). First optioned as a vehicle for Nicolas Cage back in 2012, and with William Friedkin set to direct, the project derailed six months later. Watching this finished result, it’s hard not to see why, as it’s difficult to tell if Paul Sloan’s script – he also plays crime lord Lemi – is the same now as it was then, free from any revisions or amendments. It’s a screenplay that signposts everything so far in advance, that even the most naïve or inexperienced of viewers would have no trouble predicting each step or move made by the characters before they happen. From Travolta reassuring his daughter (Schull) that the drive-by shooting that nearly killed her will be the only time she’s put in danger (yeah, right! ), to the police (Trammell, Jones) being in the pocket of both the crime lord and the governor, to the epilogue that apparently sees Travolta at the mercy of a “surprise” (not really) gunman, I Am Wrath diligently avoids doing anything that might be construed as original or different. Those with fond memories of The Blob (1988), or The Mask (1994), might be encouraged by the presence of Chuck Russell in the director’s chair, but any hopes that the fourteen year hiatus since The Scorpion King (2002) has left him pumped and raring to go should be abandoned from the start. It’s clear that Russell is just a director for hire, and his bland, uninspired approach to the material reflects this idea all too well. He’s unable to motivate his cast either, with Travolta going through the motions, Meloni playing the sidekick with a (much needed) sense of humour, Schull reduced to creating a character out of whatever reaction she’s required to have from scene to scene, St. Esprit oozing venom like it’s expected of him whatever the circumstances, Trammell and Jones playing detectives who don’t have an ounce of depth between them, and Sloan snarling away at everyone in lieu of providing a proper characterisation. It’s all as bad as it looks, dispiriting too, and without even a sense of its own absurdity to redeem matters. 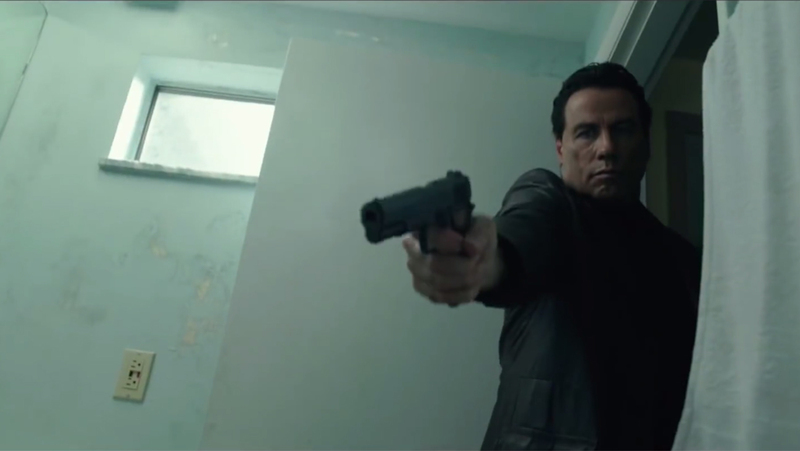 Rating: 3/10 – another nail in the coffin of Travolta’s career, I Am Wrath is disjointed, mediocre, passionless, and calamitous in equal measure, with lacklustre direction, a weak script, perfunctory performances, and woeful continuity (look for Travolta’s disappearing/reappearing forehead contusions); when movies look and sound this stale, you have to wonder what could possibly have motivated everyone to have taken part, the answer to which would probably make for a better movie than this one could ever be. The life of a lineman – in Texas at least – is one that is continually fraught with danger and the prospect of death. 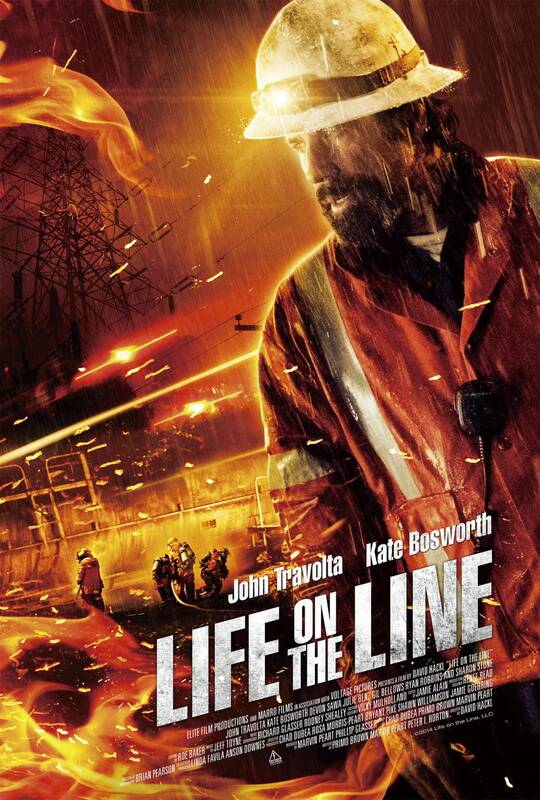 This is the message that Life on the Line reminds us of throughout its (brief enough) running time, and especially when said linemen make mistake after mistake as they go about their daily work (the movie will have health and safety experts choking on their popcorn; real linemen will either be laughing at the many, many inaccuracies the movie exhibits or shaking their heads in prolonged disbelief). But, hey, this is still the fourth most dangerous job in the world. We’re given an example of this right at the start when the actions of cocky lineman Beau Ginner (Travolta) lead to the death of his brother, who’s also his crew boss. Circumstances lead also to the death of his brother’s wife; this leaves Beau’s neice, Bailey, in his care (what the authorities were thinking is a question the movie avoids asking altogether). Fast forward ten years and Bailey (Bosworth) is on the verge of going to college, while Beau has become Mr Safety, and a well respected crew boss like his brother. The complete overhaul and replacement of thousands of miles of electrical lines throughout Texas has Beau’s crew working flat out to meet the utility company’s deadline. Two new workers – Bailey’s ex-boyfriend Duncan (Sawa), and new neighbour Eugene (Robbins) – bring their own problems to the mix, with Duncan treating Bailey in an unexplained, dismissive manner, and Eugene having trouble with PTSD since returning from Iraq. He’s distant to his wife, Carline (Benz), and is away a lot due to his work. Meanwhile, Bailey is trying to reconnect with Duncan because she has something important to tell him, while also fending off the unwanted attentions of ex-con Danny (Olsson). And Beau is coming under increasing pressure from the utility company, even to the point of being asked to “take risks” if it will get the job done sooner rather than later. By now it’s clear that all these separate storylines are likely to converge, and the movie makes it clear that this will be the case as it keeps counting down the days to a great storm. Until then the movie busies itself with some low-key soap opera dramatics mixed with random scenes such as Beau talking down an angry biker in a bar. Bailey reveals her secret to Duncan, and to Beau; Danny’s unwanted attentions escalate to the point where he targets Carline; Eugene’s paranoia leads him to climb an electrical pylon with the intention of killing himself; and a trainwreck causes Beau no end of problems, including one of his crew being injured. As the storm rages around them all, matters of life and death arise, and Beau has to make a terrible choice. Whatever you may think about John Travolta and his recent run of movies, he’s still an actor to watch, even if his performances border on the perfunctory these days. Life on the Line is no different to any other movie he’s made in the last few years, and here he does the bare mimimum in terms of characterisation and emoting, a situation his fans will be overly familiar with. There’s no spark or energy in his portrayal, no attempt to overcome the many implausibilities of the script, or the diffidence with which screenwriters Primo Brown, Peter I. Horton, Marvin Peart and Dylan Scott have created the part of Beau. 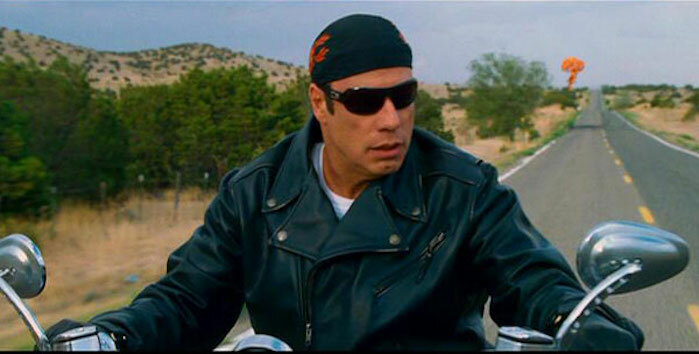 Instead he goes through the motions, and in some scenes, comes close to looking bored (when Beau harangues his crew about safety and shows them pictures of electrical burn injuries, Travolta’s delivery lacks the edge such a scene needs to show Beau’s doing this because he cares about his crew). But Travolta’s paycheck-grabbing performance is the least of the movie’s worries. The aforementioned script is quite a stinker, cobbled together and assembled on screen by Hackl and his production team with all the finesse of pre-school children being asked to build a rocket ship: you can give them all the directions and tools they’ll ever need, but they won’t know what to do with them. It’s much the same here, with Travolta and his fellow cast members continually left high and dry by the vagaries of the script and the vague intentions of Hackl, DoP Brian Pearson, and editor Jamie Alain. All three share an inability of purpose that ruins the movie from the word go. And some of the dialogue – straight from the Holy Land of Cliché – is so dire that no one can rescue it and make it sound even halfway credible. The narrative doesn’t hold up under close scrutiny, the subplots scream “Filler!”, and the denouement is so laughable and corny and hackneyed and clichéd and just plain stupid that you won’t believe your eyes and ears. As a drama, Life on the Line is the equivalent of a DOA, and should be approached as warily, as if you were, say, taking a hot dish out of the oven without the benefit of oven mitts. This is bad on a level that only low-budget movies can achieve, and while the production has attracted a reasonably talented cast, it struggles to be both interesting and dramatic, and succeeds only in giving new meaning to the word ‘risible’. Rating: 3/10 – “no one here gets out alive,” said The Doors, and Life on the Line is a perfect example of a movie that fits that kind of doom-laden vibe; blandly executed and overly reliant on plot rehashes we’ve seen a million times before, the movie stumbles along in search of someone to steer it out of the murky backwaters of its own making, and along the way, makes you wonder if anyone associated with it could ever be happy with the way it’s turned out. Once a movie is released, and especially if it’s successful, it becomes difficult to imagine another actor or actress in the lead role, and even harder if they win a clutch of awards into the bargain. Some movie stars can become so indelibly linked to a part, that if someone else takes it on in a remake or a sequel you can’t help but see the original actor in their place (you might even resent them for being there). And there are times when the very idea is wrong. Spare a thought for example, for David Soul, tasked with following in the footsteps of Humphrey Bogart as Rick Blaine in the short-lived Casablanca TV series back in 1983. No matter how world-weary he affected to be, Soul just couldn’t match Bogart for deep-seated ennui. As a result, Soul’s interpretation of the role couldn’t help but feel like a pale imitation. Here then are five movie stars and the roles they turned down. You can judge for yourselves just how successful they would have been if they’d gone ahead and played these roles, but one thing can be said for certain: each movie would have had a different dynamic as a consequence, and maybe they wouldn’t have been as successful, or as memorable. Despite a long period of pre-production and several scripts written during the process, Beverly Hills Cop was always meant to star Stallone. But with a matter of weeks to go before filming began, Stallone upped and quit the project (Steven Berkoff, who plays the movie’s villain, once said in an interview that the Rocky star quit over disagreements about which kind of orange juice was to be put in his trailer). Enter Eddie Murphy, who seized the hastily rewritten character and improvised his way into the public’s affections as the motormouth cop with a bitingly funny sense of humour. It’s hard to think of Stallone being as free or confident in the way that Murphy is, and he’s not known for comedy – Stop! Or My Mom Will Shoot (1992), anyone? – so the chances of it having been as successful as well are less conclusive, but this is one of the best examples of an actor coming in and stealing the show (thankfully). 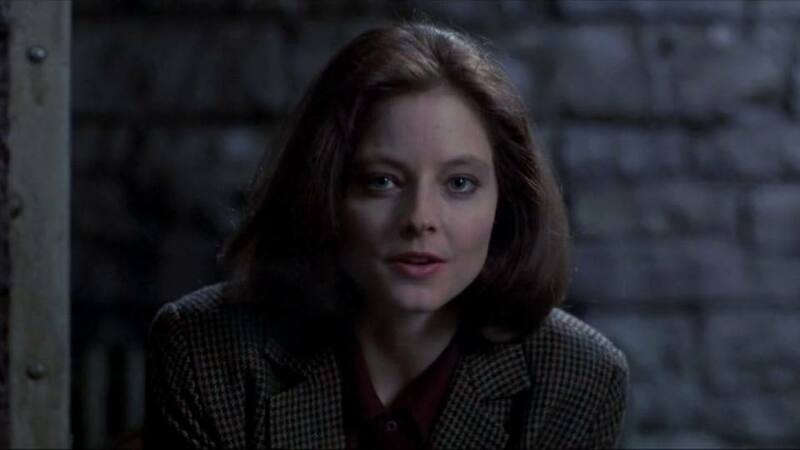 Without meaning to undermine or decry Ryan’s talent as an actress, it’s perhaps very fortunate indeed that she turned down the role of Clarice Starling, paving the way for Jodie Foster to give such a stunning performance. Like some of her contemporaries, Ryan passed on the role because she felt the movie would be too violent, but with the benefit of hindsight it’s perhaps a good thing she didn’t take on the part. As with Stallone and Beverly Hill Cop‘s humour, The Silence of the Lambs and its dark, oppressive material isn’t really Ryan’s forté, and the idea of a rookie FBI agent in bouncy curls chasing down a serial killer suddenly becomes too risible to be entertained seriously. When casting the role of Han Solo, George Lucas wanted to go with someone he hadn’t worked with before, and several up and coming actors – Christopher Walken, Kurt Russell, and Chevy Chase(!) to name but three – were considered. But De Niro was one of a handful of actors who actually turned down the role. With his appearances in Mean Streets (1973), The Godfather Part II (1974), and Taxi Driver (1976) already establishing him as one of the best actors of his generation, it was probably a wise move on De Niro’s part, but what he would have made of lines such as, “It’s the ship that made the Kessel Run in less than twelve parsecs” is still a tantalising proposition. Throughout his career, Travolta has turned down a number of roles that, in other actors’ hands, have led to critical acclaim and their movies’ success at the box office. And this isn’t the only time that Tom Hanks has benefitted from Travolta’s reluctance to take on a role: he also turned down the role of Paul Edgecombe in The Green Mile (1999). 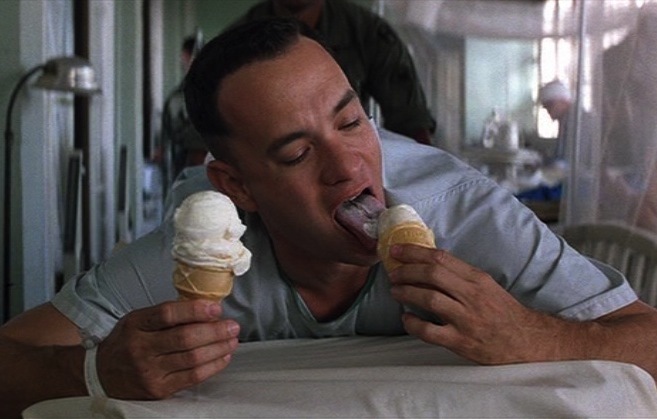 But this decision is one that Travolta still regrets today, and though it’s hard to imagine him reciting the line, “Mama always said life was like a box of chocolates” with the same naïve innocence as Hanks does, it would have been interesting to see him adapt his naturally effusive style of acting to the role. It’s often interesting to hear about proposed casting choices and the odd matches of actor or actress to a role, but the idea of Midler playing dowdy, homicidal Annie Wilkes is one that takes some adjusting to (especially given Kathy Bates’ Oscar-winning performance). Nothing in Midler’s career up til then (or since) gives any indication that she would have been effective in the role, so maybe she knew she was making the right decision – but to have been offered the role in the first place? Bizarre, just very bizarre. There’s a phrase that everyone will be familiar with: “Too many [insert item here], too little time”. When it comes to the number of movies that I watch in any given month, that phrase is apt in relation to the ones that get reviewed here on thedullwoodexperiment. I would love to have the time to post reviews of all the movies I see, but it’s just not practical; and besides which, some movies just don’t merit the attention (Annabelle (2014), for instance). Sometimes it’s a case of choosing one movie over another, sometimes Life gets in the way of blogging and a movie falls by the wayside. To combat this, and to give these “other” movies their due, I’ve decided to present, at the end of each month, a brief “review” of all the other movies I’ve seen. There won’t be any synopsis, or proper full-length analysis, just the title, director, running time, cast, and then the traditional two sentence ratings summation. So, let’s see which movies didn’t quite make the cut in May 2015. Rating: 5/10 – Travolta’s art forger comes out of prison to spend time with his dying son (Sheridan) and pull off an audacious robbery; a derivative, occasionally unappealing crime drama that tries to do something different with its dying child angle, The Forger is nevertheless a movie whose “one last heist” scenario has been done to death elsewhere, and with far better results. Rating: 6/10 – Western legend Bat Masterson (McCrea) tackles corruption supported by Haggerty’s devious sheriff in Dodge City and faces romantic problems as well from minister’s daughter Adams and saloon owner Gates; a middling, mildly diverting Western, The Gunfight at Dodge City benefits from McCrea’s solid, no-nonsense performance and Newman’s underrated abilities behind the camera. 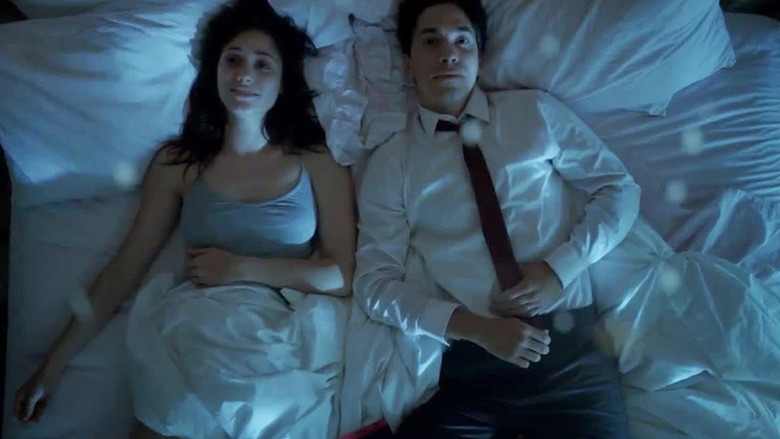 Rating: 7/10 – Long and Rossum are the soulmates whose on-again-off-again relationship is examined over the course of six years; with the narrative continually fractured and reassembled, Comet is replete with the kind of “serious” romantic musings that sound alternately pretentious and profound, but the two leads have a definite chemistry and this helps immensely in making the movie as enjoyable as it (largely) is. 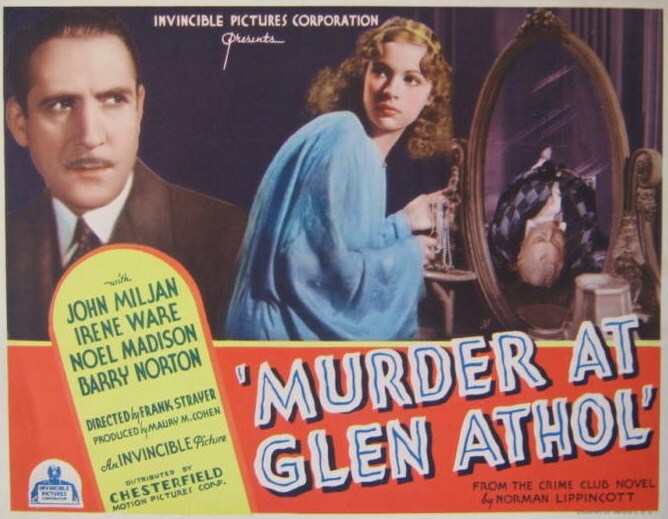 Rating: 5/10 – two murders and a dying confession confuse matters for a detective (Miljan) who’s just trying to take a vacation – next door to where the murders have taken place; packed full of seemingly endless exposition and no shortage of suspects, Murder at Glen Athol is a sprightly murder mystery that packs a lot in but not always to its best advantage. 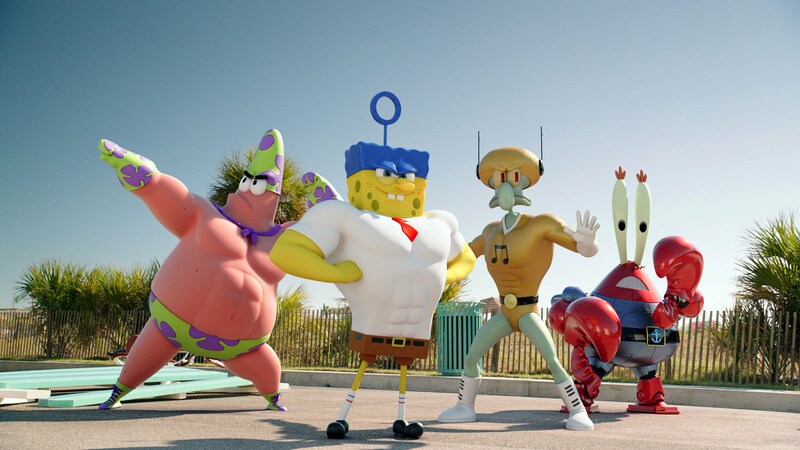 Rating: 7/10 – when the formula for Krabby Patty is stolen by the notorious Burger Beard (Banderas), SpongeBob (Kenny) is forced to team up with Plankton (Mr. Lawrence) to get it back… and venture above the surface; freewheeling fun with the denizens of Bikini Bottom that features lots of gags and the usual bright visuals, but takes an awfully long time in getting to the “sponge out of water” part. 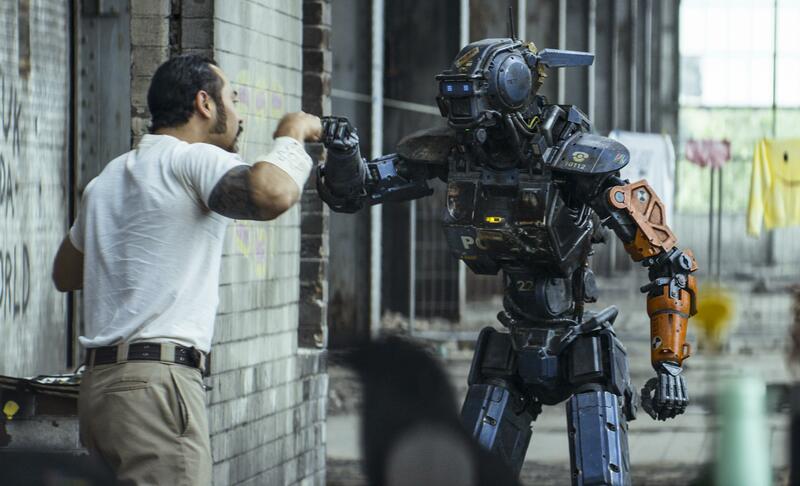 Rating: 6/10 – with a robot police force firmly established in Johannesburg, the introduction of artificial intelligence leads to one robot, named Chappie, learning what it’s like to be human; disappointing outing from Blomkamp that never quite gels or seems sure of what it’s trying to do or say, but does feature an excellent performance from Copley. Rating: 5/10 – when newspaper reporter Jack Moir (Phillips) is framed for robbery by arch-nemesis “The Duke” (Pastell), he swears to get even when he gets out of jail; a low-key crime drama that seems busier than it is and which gets bogged down in the mechanics of Moir’s revenge plot, Impact does allow for a welcome appearance by Berkeley aka Fawlty Towers‘ Major, and an above average performance by Pastell. 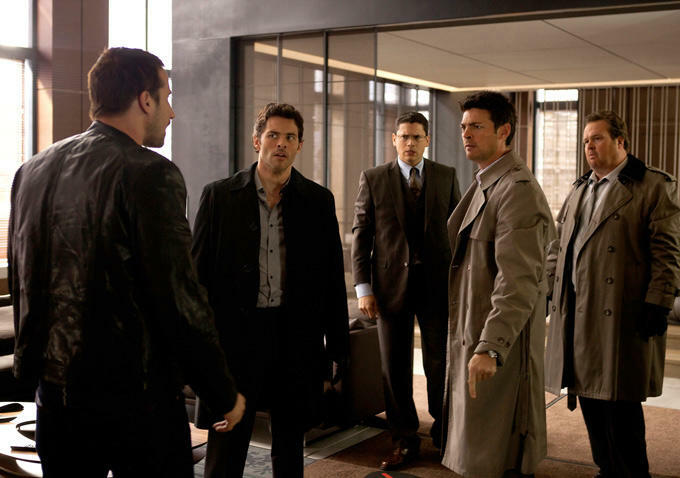 Rating: 6/10 – the discovery of a woman’s dead body in the loft apartment shared by five married men for their secret liaisons prompts them to suspect each other of the crime; alternately gripping and implausible, The Loft is a modern day cautionary tale that loses credibility with its solution then recovers with a great twist, but still has the air of a thriller that its writer never quite got to grips with. Rating: 5/10 – Swarf salesman Dan Trunkman (Vaughn) has to overcome all sorts of obstacles to land the contract that will save his fledgling company from going under, including a visit to a Berlin gay bar; a bit of a strange fish, Unfinished Business suffers from being two separate movies joined at the hip: one a raucous comedy, the other a thoughtful study of bullying, but together they don’t make for a cohesive whole, and it’s yet another movie where Vaughn coasts along on former glories.